CPS Setanta: what we did! Have you ever read a book that was later turned into a film? In books, authors use rich written descriptions to depict the spaces they imagine, in order to let the reader imagine these spaces for themselves. However more often than not, once we view the film, our perception of the space differs from that of the film, we are now offered two alternate readings of the same space. This became a group discussion, each group chose a space from a book & film, they verbally described it to the class and also depicted their chosen space in drawing form. Group Discussions, spatial observation, oral presentations, model making, Drawing, photography and Exhibition design. During these workshops, the Student’s perception of space was examined. They learnt to experience an alternate visual relationship with familiar architecture in and around their school. Many people have authentic relationships with streets, buildings and spaces they interact with on a regular basis, but may only have this at an unconscious or automatic level. 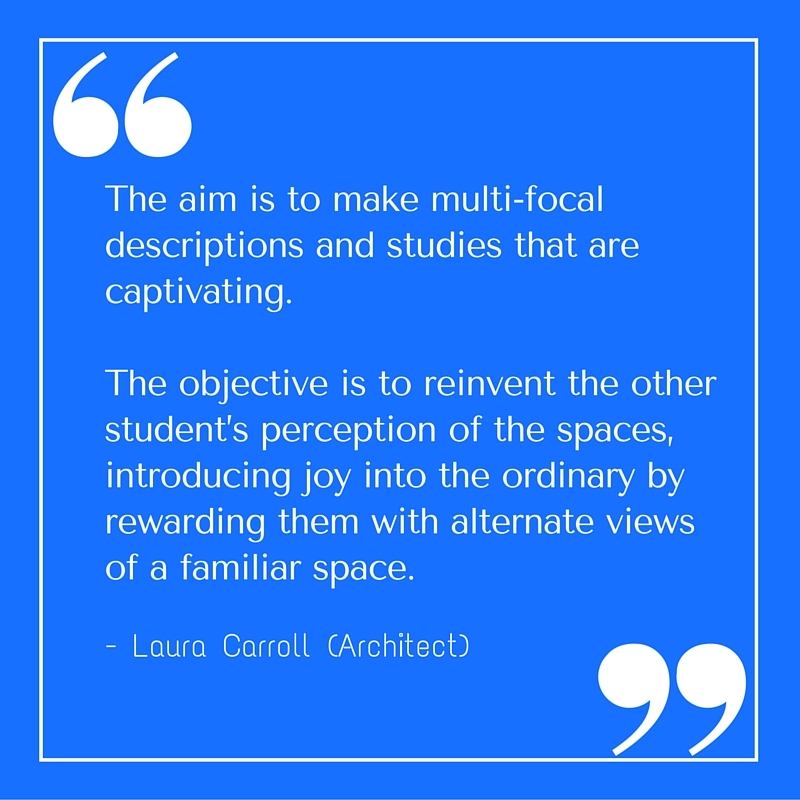 By choosing a space that intrigued the students, and by studying every aspect of this chosen space, through sketching, photography, writing and model making, they succeeded in heightening their conscious experience of space. This project aimed to consider these alternate views of familiar spaces. 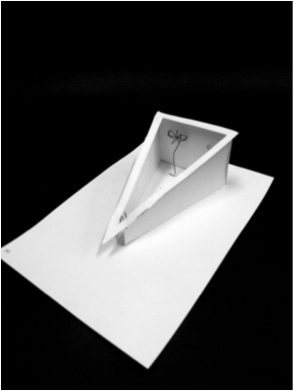 Each student chose a space of interest within the chosen area (a niche, a trapped space, a threshold, junction between spaces…) They wrote a short written description of their initial reaction to the space. This description was placed in an envelope and sealed. Was the space tall, squat, narrow, imposing, dark, light, closed? What sort of materials were used in this space? 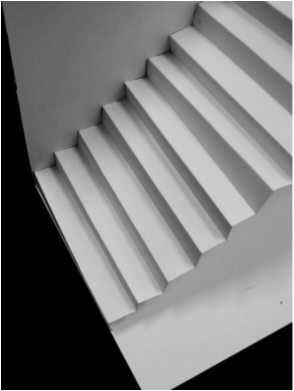 How do the materials impact on the their perception of the space? Why did they like/ dislike this space? What made them choose the space? Is it functional? Does it get used as it was designed? 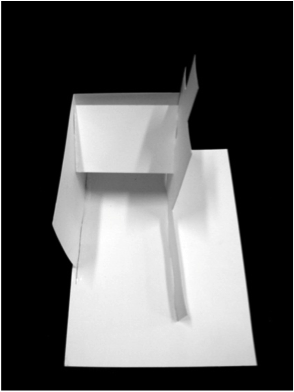 Having completed Brief 1 students made models of the space chosen. They were provided with 1 A2 sheet of white card. They were to depict their experience/ perception of their chosen space in 3d form. They were given another students sealed envelope, they carefully read the descriptions and tried to interpret the information given of their new space. 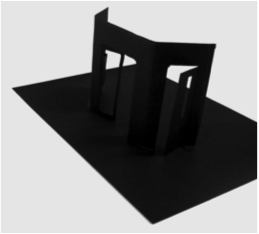 They made a second model, this time using the black card provided. They depicted their perception of their classmate’s space purely from the written description. 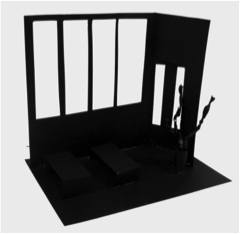 Each Space was depicted twice in model form, once by the student who chose it, and once by a student who had not seen the space. “I thoroughly enjoyed the whole experience, Having found my own interest in architecture as a career myself in Transition Year, this initiative meant a lot to me. I also learned to adjust how I speak about architecture, which, I think will be invaluable in dealing with clients in the future. Sign up to our newsletter to keep up-to-date with all events and activity related to the Architects in Schools Initiative.